Reno, Nev. April 12, 2018. 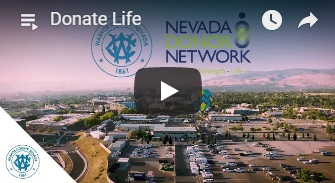 The month of April marks Donate Life Month around the nation, but this Friday, April 13, 2018 the community is asked to wear blue & green to raise awareness of tissue and cornea donation in northern Nevada, and Washoe County is taking the lead. “We are excited we can bring more attention to the need and benefits of tissue and cornea donation in our community,” says Dr. Laura Knight, Washoe County Chief Medical Examiner and Coroner. In addition to raising awareness, Dr. Knight worked to spearhead a new tissue and cornea donation program from the Medical Examiner’s Office with the help of partner, Nevada Donor Network. Washoe County staff, and Nevadans around the state, will be taking to social media posting photos wearing blue & green with the hashtag: #BlueGreenDay.